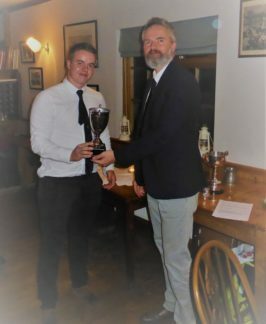 The Club held their annual dinner and trophy presentation at the Bathwick Boatman last Saturday. In front of 40 members and guests the club Chairman, Andrew Willis, presented the trophies for the various winners of the seasons competitions plus three trophies awarded by the clubs committee for play over the whole season. The Garrard Trophy for the most improved player was awarded to Daniel Gott. Daniel has competed at the highest level of Association Croquet this year. 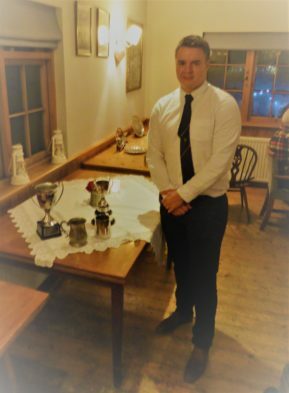 He won the national Students Championships, reached the semi-final of the South of England Championship, the last 16 of the English Open Championships and was selected for the Croquet Association’s AC International Development squad. As a result he has brought his AC handicap down to -1.5 and is currently 71st in the world rankings. On the home front he also won the clubs Advanced Level singles, One Ball and GC Level play trophies. The Nick King Trophy for the most improved newcomer went to Tony Jackson and the Captains Cup, for the member contributing most to the SWF league teams, went to Philip de Glanville. Lorne Loxterkamp had a successful season winning the AC handicap singles, GC handicap singles and the season long League for GC handicap play Trophies. Another to win more than one trophy was David Prescott who picked up the Stopforth Cup (Advanced level singles -handicap 6 and above) and the AC Short Lawns trophy. Other trophy winners were Bob Hart, Mary Bertin, Roger Hayes & Mo Bell, and Sue Andrew.